I was recently invited to enter a photoblogging competition called “Explore the Elements”, sponsored by the British travel company Thomas Cook. I don’t do this kind of thing very often on my blog, but the contest has a really interesting theme that I can’t resist. Plus I have the chance to win some pretty nice prizes. The idea behind the competition is for bloggers to submit photos representing the four elements of nature: earth, air, fire, and water. The representations can be literal or figurative and we can only submit one photo per category. A panel of expert judges will select a winner for each category, as well as an overall winner. 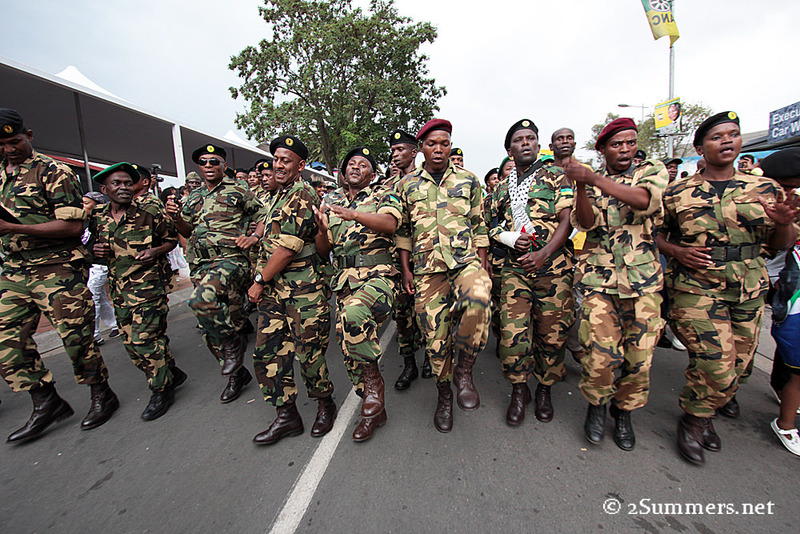 Members of Umkhonto we Sizwe, the armed wing of the ANC, march through Soweto on the weekend after Nelson Mandela’s death. This is the most unconventional of my entry choices. The photo, which I shot in Soweto a couple of days after Nelson Mandela died, represents “earth” to me for several reasons: the boots on the ground, the earth tones of the uniforms, the solid “wall” of soldiers, the authority of their expressions. I will never forget the moment when I shot this; I was only a couple of meters in front of the marchers and I felt completely electrified. Less than five minutes later, the skies opened and we were all drenched by a massive thunderstorm. I’m grateful the rain held off for those five minutes. 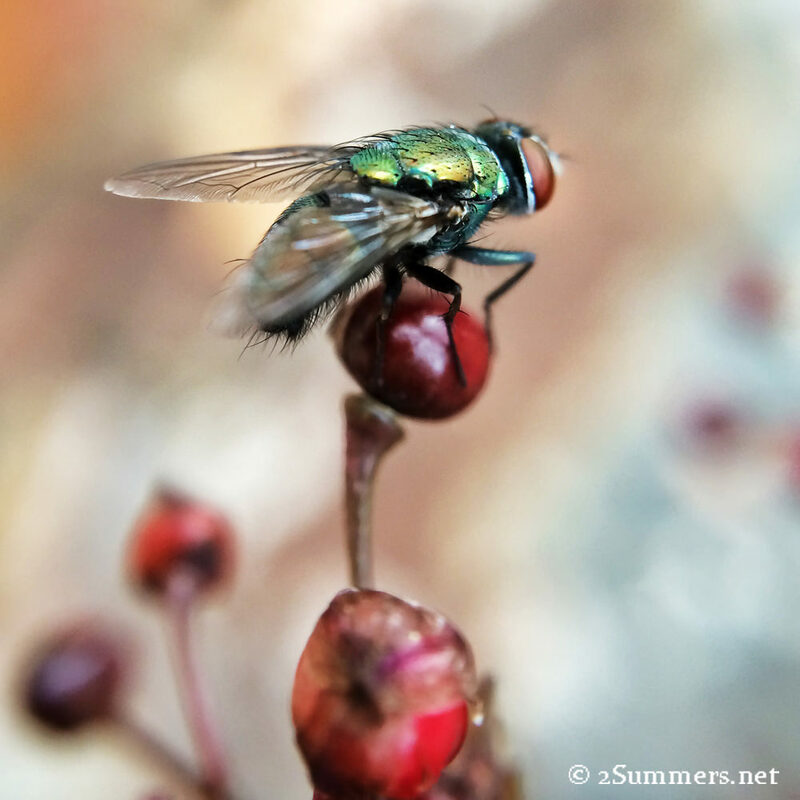 A fly in my backyard in Johannesburg, shot on my iPhone with an olloclip macro lens attachment. I know that this contest is meant for travel photos. But I’m a homebody at heart and sometimes I like to travel in my own backyard. Flies, although I hate them, are lighter than air and are as elusive and evasive as any animal can be. Wise? Maybe. Benevolent and compassionate? Not so much. But I still think this picture works for the category. Incidentally, I shot the photo with my iPhone and a macro lens attachment. It’s by far the best macro shot I’ve ever taken. 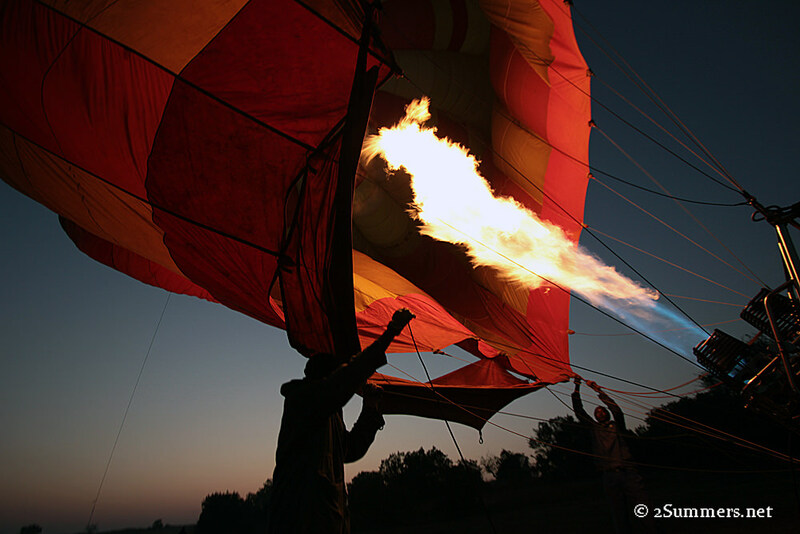 A hot air balloon inflates in Magaliesburg, South Africa. This entry is self-explanatory. My hot air balloon ride over the Magaliesburg Mountains is undoubtedly one of the coolest things I’ve ever done as a travel blogger. I enjoyed watching the balloons inflate just as much as I enjoyed the ride itself. Watching this helped me to realize just how powerful a hot fire can be. I don’t have one particular thing to say about this photo. I’ve used it in a couple of different blog posts because it tells a lot of different stories. 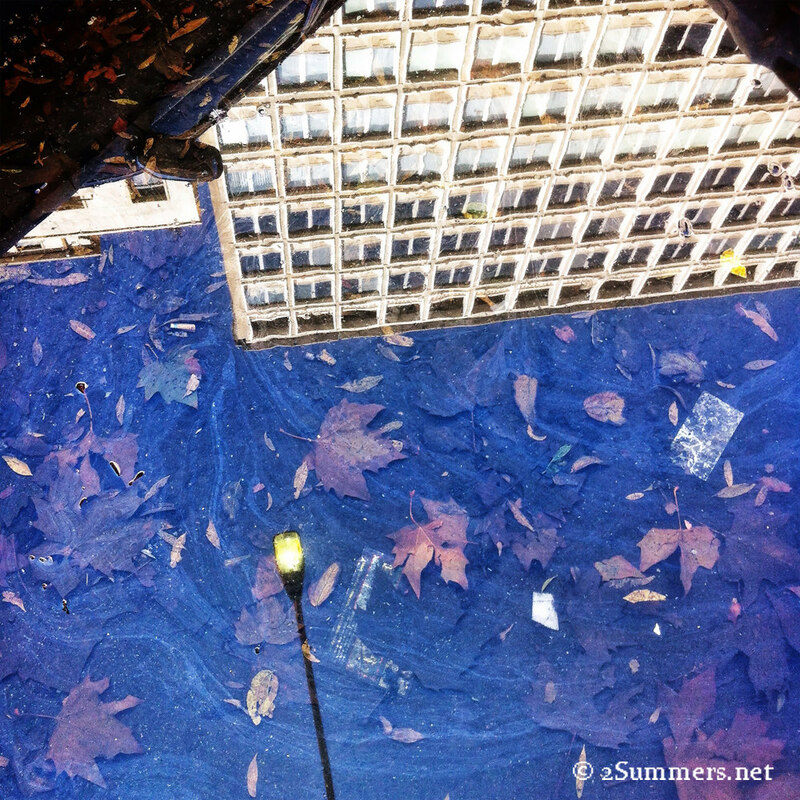 The story of how I shot it is simple: I was walking down a street in downtown Joburg, I saw a dirty puddle of water, I grabbed my phone and shot a picture, I continued walking down the street. It wasn’t until later that scrolled through my camera roll and realized that I’d captured the essence of Johannesburg. This photo represents Joburg and it represents me. 1) Namrata at MiaMusings.com: Like me, Namrata came to Joburg as an expat and has now become a local who knows more than most natives. I love her adventurous spirit and I hope she’ll enjoy this challenge. 2) Matt at ExpertVagabond.com: Matt is one of the top travel blogger/photographers in the world. I’m hesitant to nominate him because he could greatly reduce my own chances of winning. But I’m doing it anyway because I think he’s a badass. 3) Ishay at FoodandtheFabulous.com: Ishay blogs about food and travel. I love her style and she is a fabulous person, as the name of her blog implies. I hope she finds time to enter this contest because I’d love to see what she comes up with. 4) Tim at Timmee.me: Tim is a fellow Joburger and Instagrammer, and also one of my best friends. He’s quiet, creative, and a great photographer. You’d better enter, Timmee. 5) Alessio at JustaGeekDoing.com: Alessio is another good friend of mine who I met through Instagram. He is a guy who knows about social media stuff, a fashionable dresser, and an occasional baby-sitter for the Melville Cat. I sometimes make fun of him for being too cool for school, but that’s only because I’m jealous. Good luck. Looks like a strong entry. Love the water image. Thanks Dad. That seems to be everyone’s favorite. Stunning photos – personally think you captured every element perfectly! Love your blog! Thanks so much, Maria. I appreciate the comment.